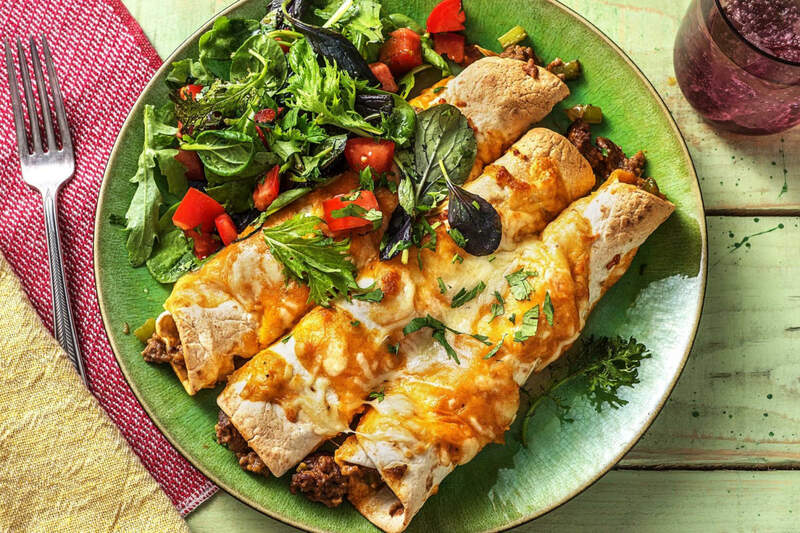 Veggie ground round makes this dish savoury and filling while veggies and fresh lime make it fresh and bright. 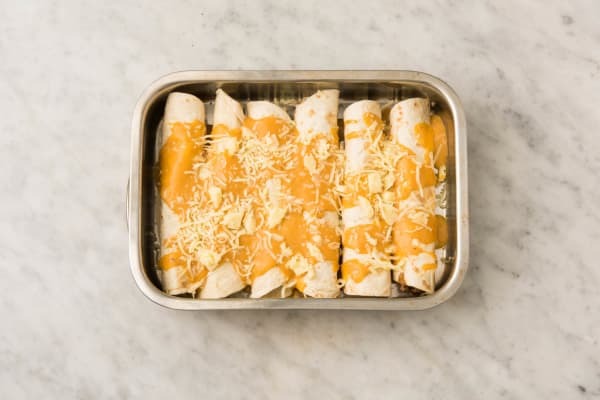 You'll love the textures and flavours of these super easy enchiladas. Wash and dry all produce. * Core, then cut the peppers into 1/2-inch cubes. Heat a medium non-stick pan over medium-high heat. When pan is hot, add 1 tbsp oil, then onions and peppers. Cook, stirring, until softened, 4-5 min. Add the ground round and remaining Mexican seasoning. 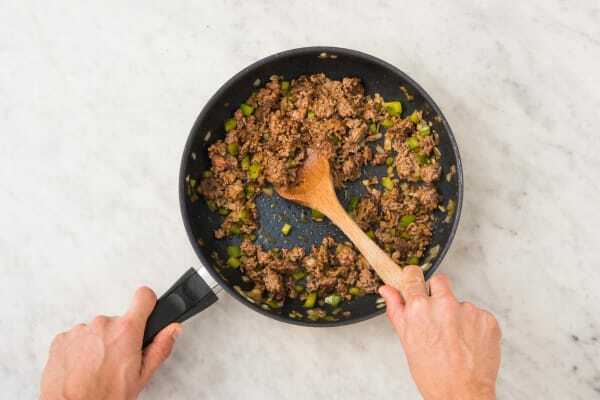 Cook, stirring, until warmed through, 2-3 min. Remove the pan from the heat. Stir half the sauce from the small pot into the pan with the veggie mixture. Spray or wipe an 8x8-inch baking dish with 2 tbsp oil. Place the tortillas on a clean work surface and divide the veggie mixture between the tortillas. 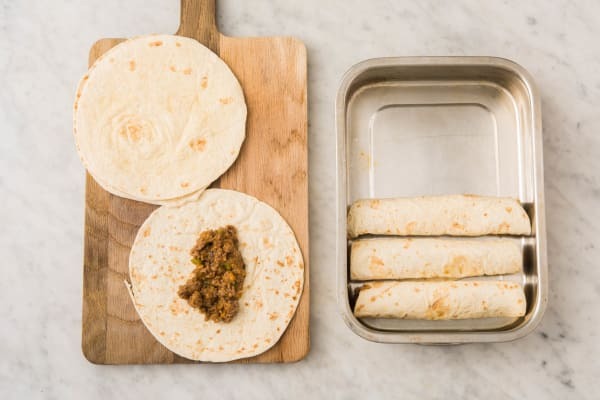 Roll each of the tortillas up to close and place, seam-side down, in the prepared baking dish. 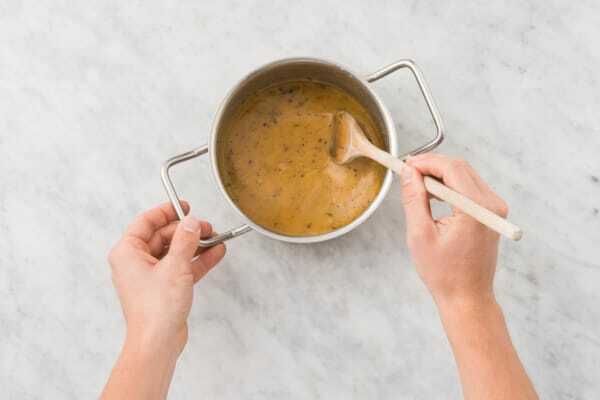 Drizzle the reserved sauce from the small bowl onto the prepared enchiladas. Sprinkle with the cheese. Broil in the middle of the oven until the cheese melts, 3-4 min. Meanwhile, cut the tomatoes into 1/2-inch cubes. Roughly chop the cilantro. Zest, then juice the lime. In a small bowl, whisk together the 1 tsp sugar, 1 tbsp lime juice, half the lime zest and 2 tbsp oil. Season with salt and pepper. 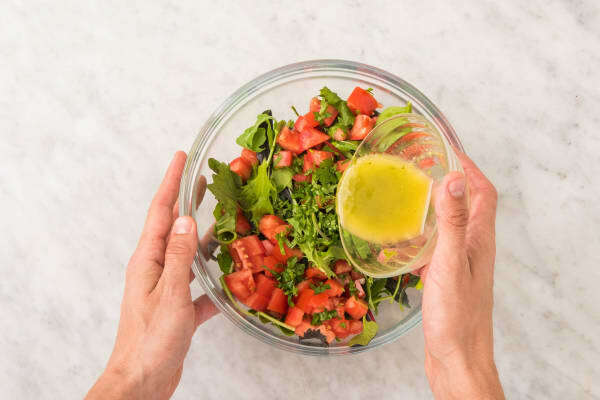 In a large bowl, add the spring mix and tomatoes. Drizzle over as much dressing as you want and toss to combine. 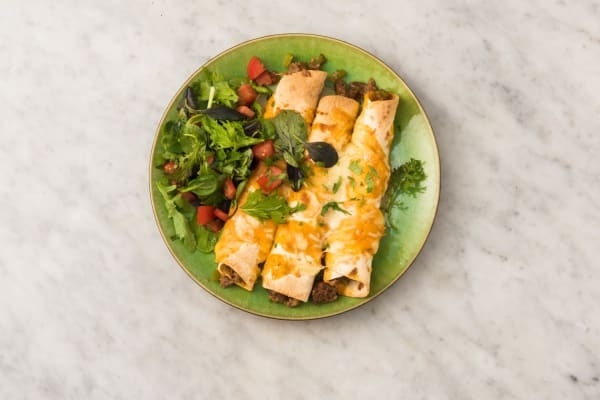 Divide the enchiladas and salad between plates. Sprinkle over the cilantro.